Online shopping is fiercely growing in India – Infact, it is now getting to a level where offline retailers have started to get worried. But as a consumer, it is time to rejoice, as online shopping offers them many benefits, the biggest of them all being the low prices on products. However, how does an online shopper get the best price while shopping online? There are so many online stores that it is nearly impossible to know the site you are buying from has the best rates on the product you are purchasing. Yes, there are plenty of online price comparison sites like Junglee, MySmartPrice and many more, where you can see comparative pricing and that is definitely one way of discovering best price. Buyhatke, an online shopping price comparison site has come up with a nifty chrome extension – Compare Hatke – which does a great job for you. As a shopper you do not need to visit a comparison site to find best prices. It will bring the best prices to you even though you may be on one of the many ecommerce sites! Buy Hatke – How Does it Work? First off, the user needs to install a chrome extension (it works only on Chrome). Once it is installed, you are all set. Just visit your favourite shopping sites and search for product you want. When you are on the product page, the extension will seamlessly find prices from over 50 stores and will show you the site offering best price on the product that you are looking at. 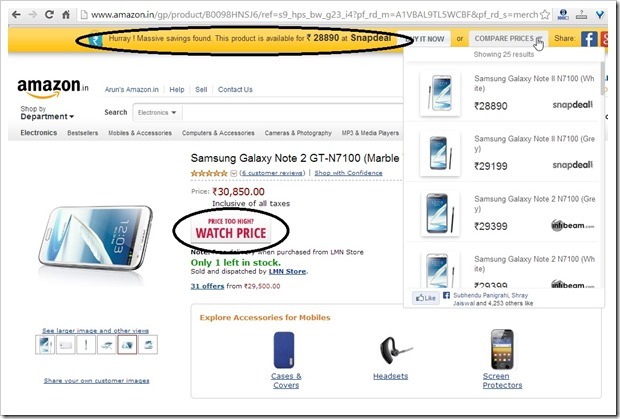 For example: Lets say, I was planning to buy Samsung Galaxy Note 2, and looking at price on Amazon, the “Compare hatke” chrome extension will kick in, search for best prices from various different price and show it to you on the page in the top bar. There is also another interesting feature called “Watch Price” – Everytime you are on a product page, you will see a button called “watch price”, which will allow you to follow the price changes of the product. So everytime the price of the product drops, you will get an email letting you know the same. What I really like about this extension is the non-intrusive nature. It does not force you to do anything out of the way. It definitely helps you in making a more informed product buying decision. Also, what I like is, it does show prices from most of the ecommerce stores in India including eBay! On a separate note, I suggest you also read about pitfalls of making online purchases. Sometimes lower costs come at a price, which you should be aware of! Guess Which Country Uses Twitter More Than Anyone Else In The World? Yes, I am using this now it is really good. Thanks Hussain :) Do spread the word amongst your friends. We are also contemplating of showing a price fluctation trends for major stores for an iteam. Would love to know from users the utility of such a thing.